I love gradients. That is no secret at this point. But I don't really love this one. 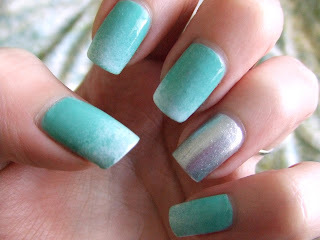 I used Essie's Turquoise & Caicos for the aqua color and Essie's Blanc for the white. Those two formulas DO NOT blend well. It took me 3 thick coats to get the aqua to be opaque, which is against my rule in general. The Silver is Maybelline's Pedal to the Metal over...something, I forget now. Initially, this manicure was inspired by an old pick-up I saw cruising down the street...all shiny paint and chrome. But once I was finished with it, all I could see was seamfoam and random silver. Not what I was going for. I definitely feel like I'm in a slump, inspiration-wise. It has that classic car look, but the gradient is so subtle! yeah, I really didn't intend for it to be so subtle. But the turquoise & caicos was so hard to work with. It took THREE thick coats to get it to look opaque.